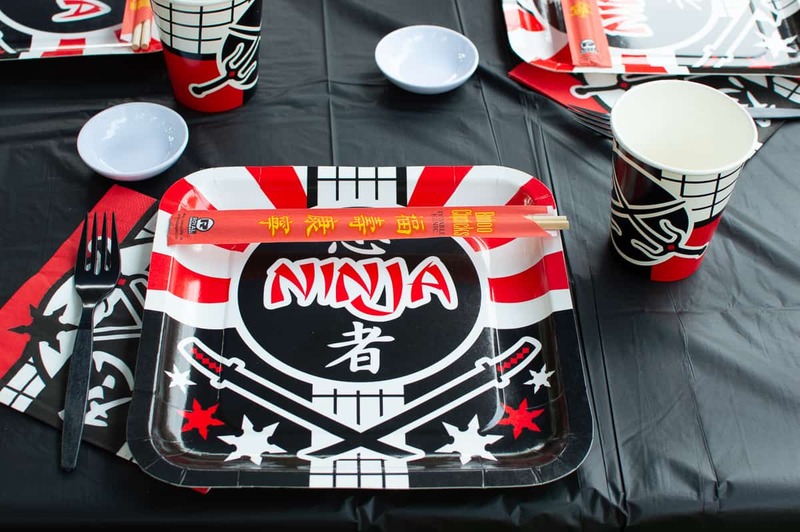 I’m so excited to share these Ninja party ideas with you today. Believe it or not this party is from last August but I’m just getting around to posting it now! The last few months have been a bit of a blur – let’s just say I’ve been sleeping a lot as I prepare for baby #3. 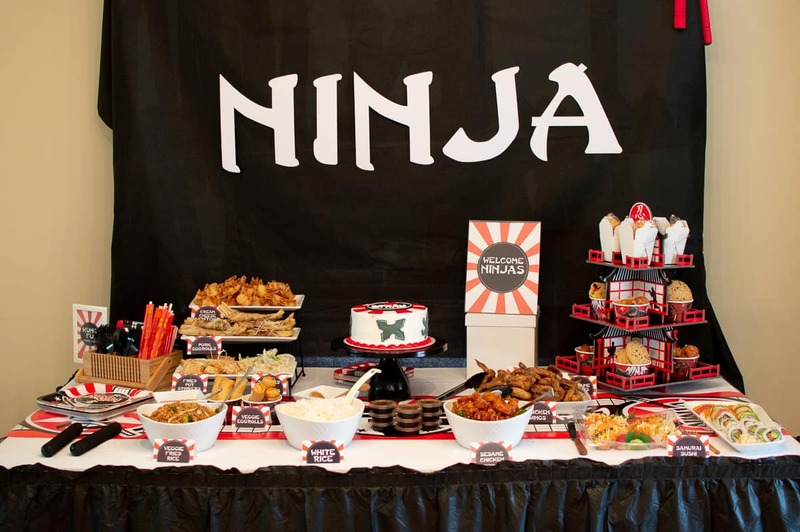 For my son’s 5th birthday he chose a Ninja theme. 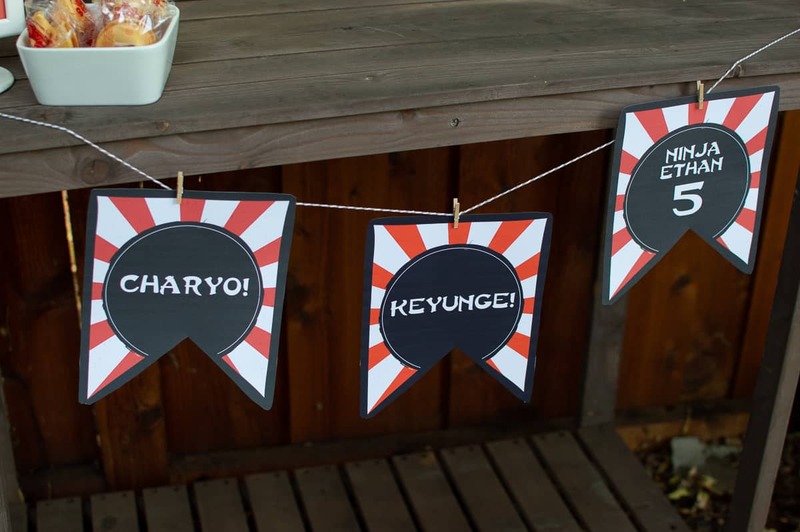 He’s been in karate for the past six months and we thought it would be a fun to incorporate it into the party theme. 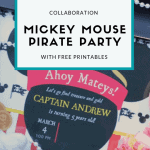 I always like my kiddos to get in on the fun of picking their birthday party and we usually start throwing out ideas months in advance. 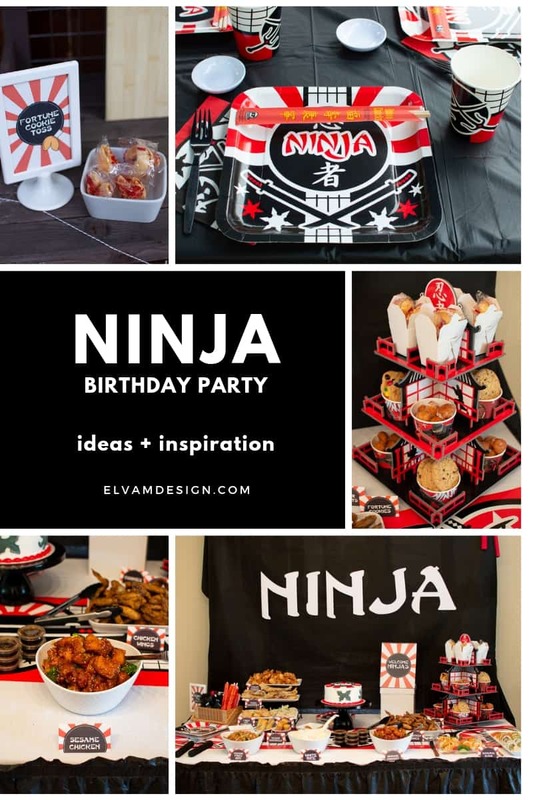 I hope you find some fun ideas and inspiration to throw your own karate birthday party! 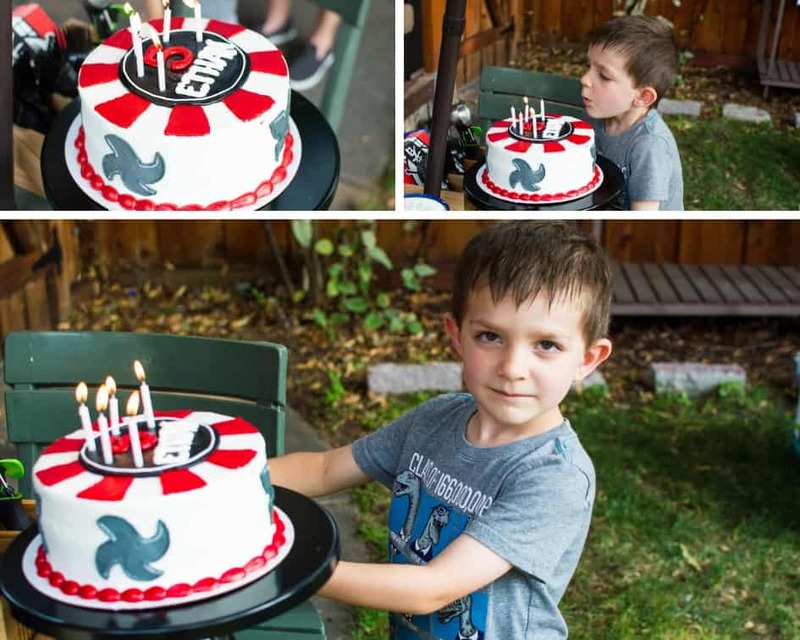 I love that my son’s birthday is in August, as that means we can set up a few tables in the backyard. I made sure to use a pop up shelter to provide some shade for our guests. The sun can be brutal in the afternoon! 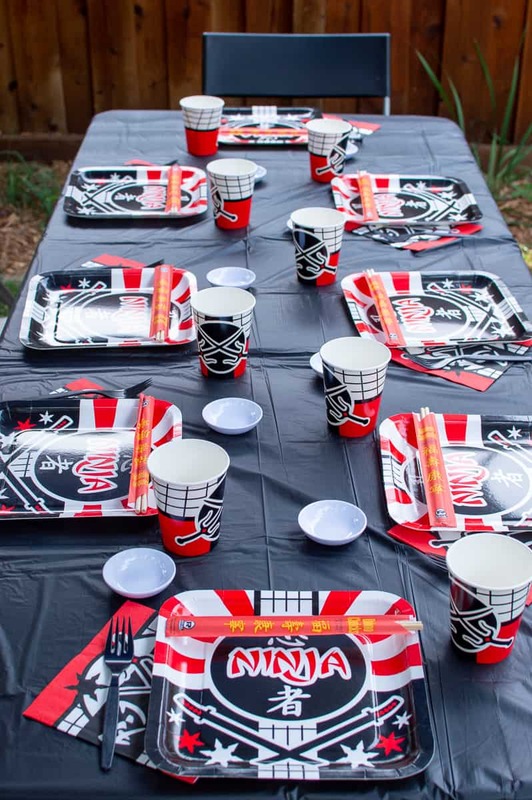 We went with a traditional color scheme of black, white, and red for the party decor. 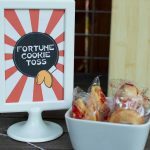 While I typically start with the party printables and then find matching decor, in this case I started with the supplies. 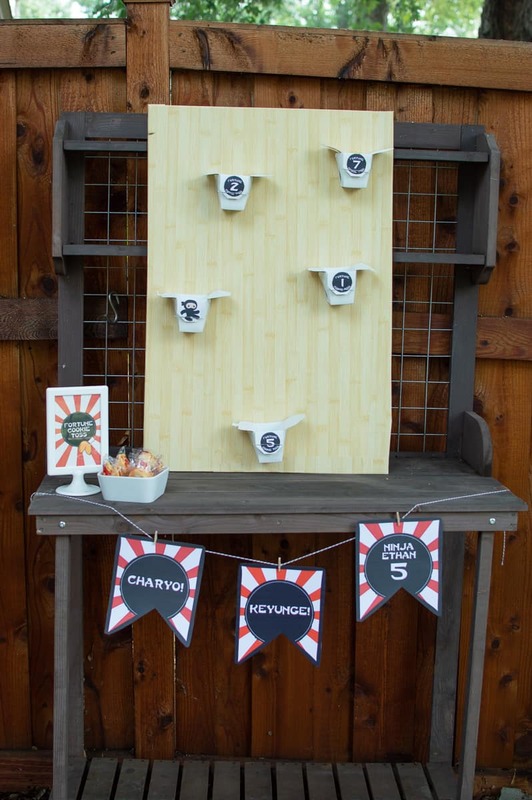 Finding supplies for this party theme was easy by turning to some of my go-to sources: Oriental Trading and Amazon. 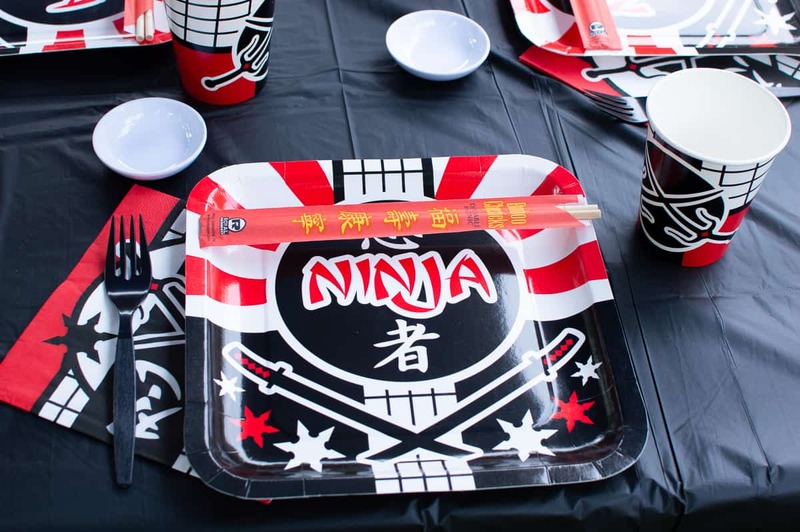 Oriental Trading had a fun selection of Ninja party supplies, that went perfect with our theme. On Amazon, I found those cute little melamine soy sauce cups. I think I’ll have to have a sushi night once baby is here to use them again. They are great for prepping recipes with lots of little ingredients and spices too. 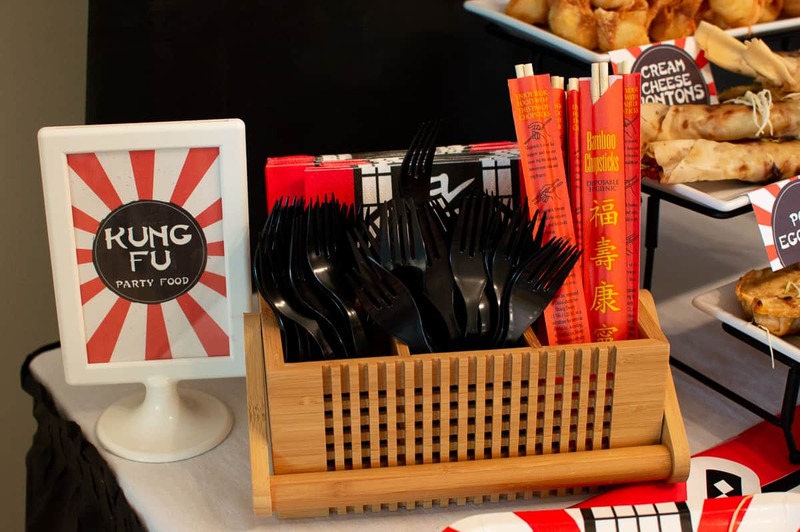 I had our Chinese food caterer provide the chopsticks, but you can grab a set for a very economical price. Speaking of the food, I kept it simple this year by catering almost all of the food. 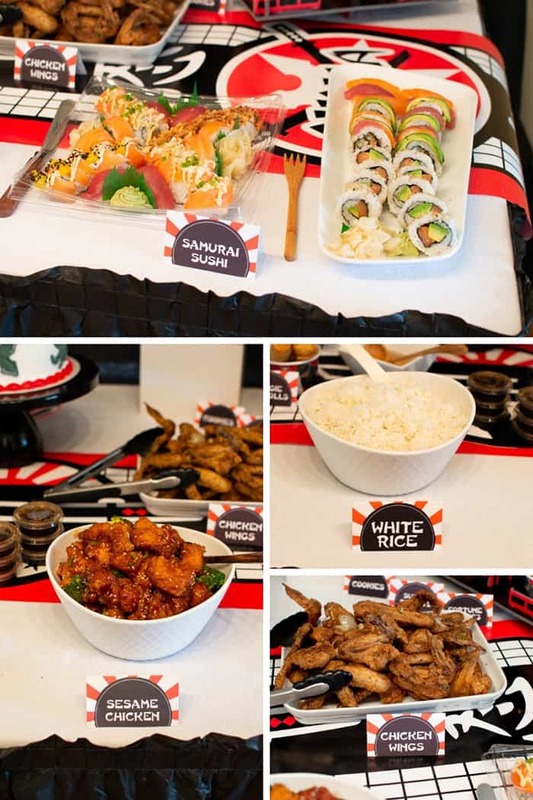 It really was a game changer to not have to prep anything in advance and is something I will seek out for future parties. I found a local Minneapolis Chinese restaurant, Dragon Wok, that does party catering and even delivered it! 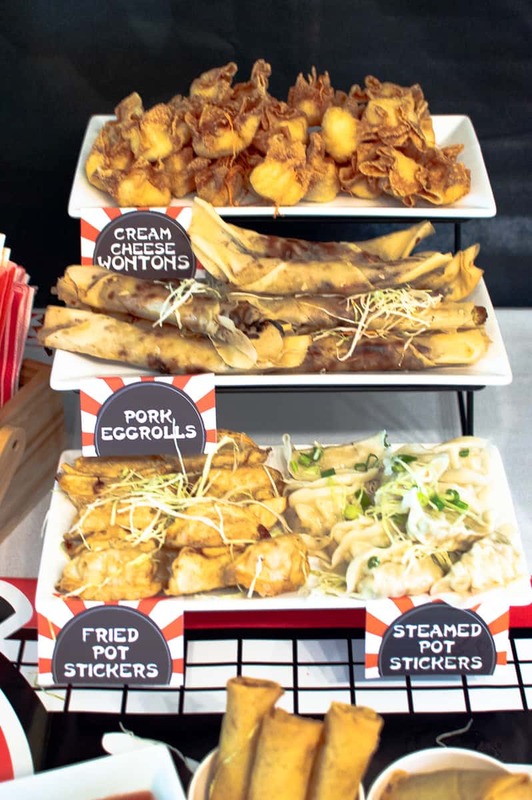 It was so nice receiving hot food moments before the party. All I had to do was transfer the food to my serving dishes, including this 3-tiered tray. The appetizers looked so great all stacked up on it. We went with mostly appetizers, but I ordered one main entree and some rice. I love throwing parties at slightly off hours, so that an entire meal doesn’t have to be provided, though we certainly had plenty of food. I’m saving you some time, by providing our menu below! We also had plenty of desserts! 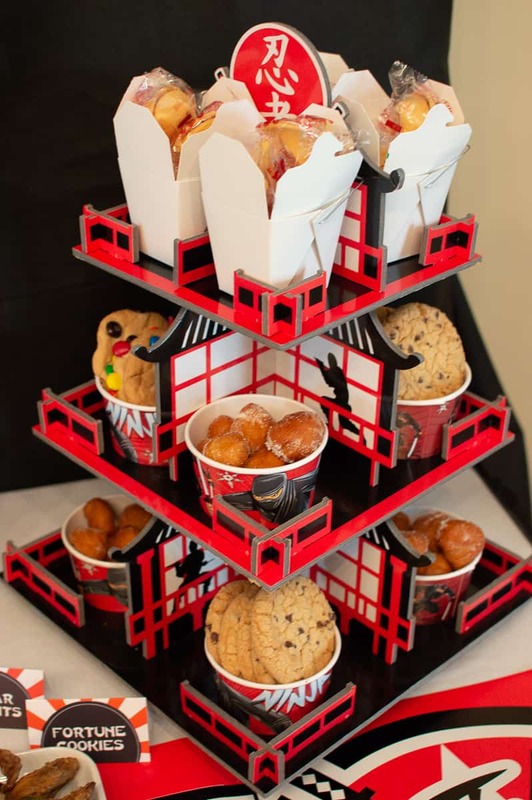 I found this cute ninja cupcake stand at Oriental Trading and used it to display some of the desserts on it, including fortune cookies (supplied by the caterer), cookies, and the sugar biscuits. You can grab a set of takeout containers (or better yet, ask your caterer for some extra clean ones) to hold some of the desserts. These would be cute for sending home leftovers with party guests or to use as party favor boxes. We didn’t do party favors this year, but I did use these takeout containers in a unique way for one of our activities. More on that below. Of course we also had cake and I went to my go-to: Target Bakery, available at SuperTarget. I love how they will create any design I bring in. I displayed the cake on this very versatile black cake stand from Amalfi Decor. 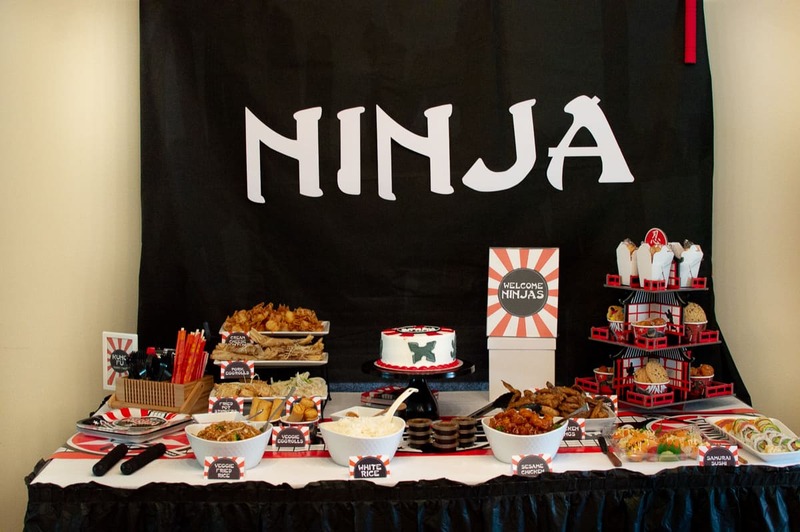 All of this food created an awesome party food table! To create this look I set up my photography stand with a large black backdrop and spelled out NINJA on card stock, using my Silhouette Cameo. On the table I simply used a white table cloth I had on hand and layered on a ninja table runner. Add a black table skirt for a finished look. 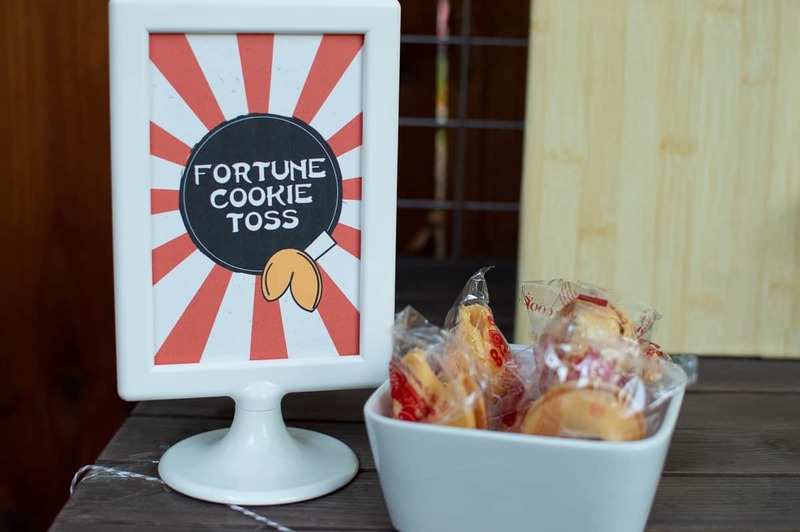 We tested our ninja skills with a few games, including this DIY Fortune Cookie Toss. Check out the tutorial (with a free printable) to make your own. Guests tested their tossing skills by trying to get as many points as they could. 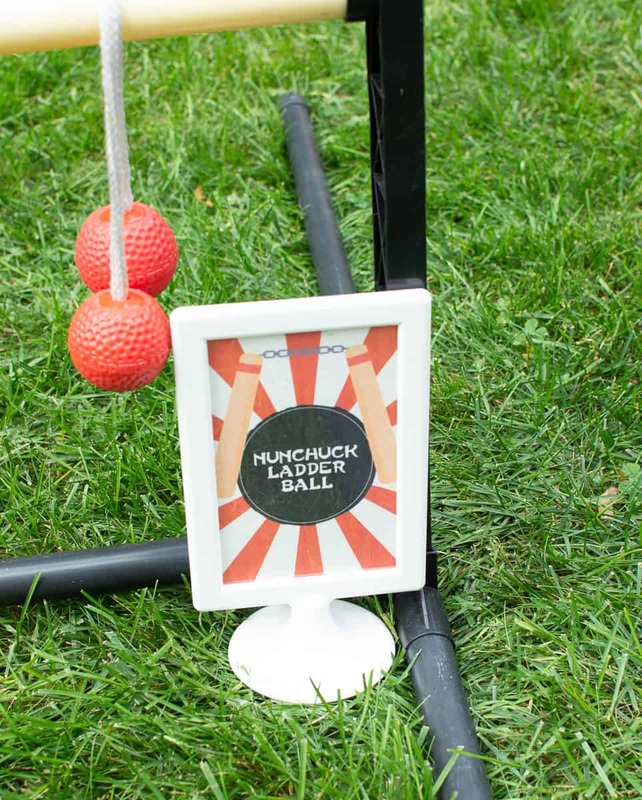 We also pulled out the Ladder Ball game to test out our “nunchuck” throwing skills. 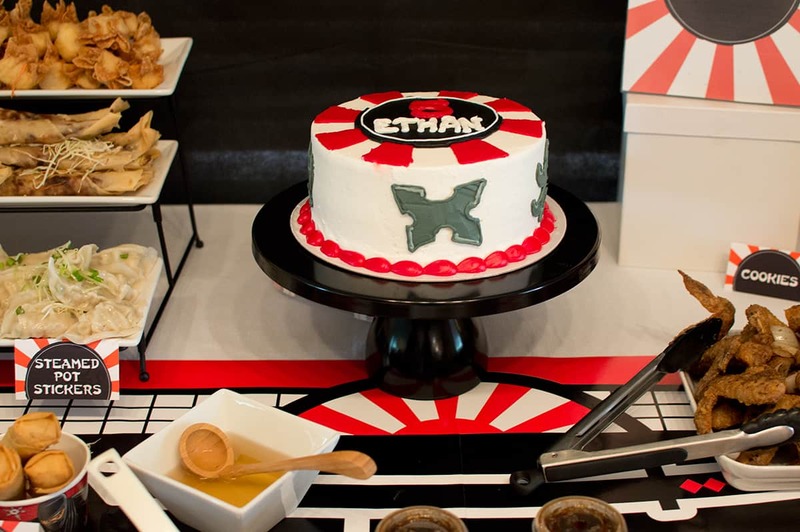 For the start of the party Ethan wore his karate uniform, but that didn’t last long and unfortunately I didn’t snag a picture before it came off. I don’t blame him for wanting it off, it was a hot day! We enjoyed our cake and ice cream outside and said “hiya” to five! 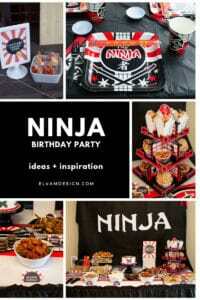 I hope you found some ideas and inspiration for your own Ninja birthday. 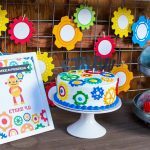 If you are looking for other fun kid-friendly birthday party ideas, be sure to check out our Robot 4.0 Birthday, this Three-Rex Dinosaur party, and this Puppy Pawty.